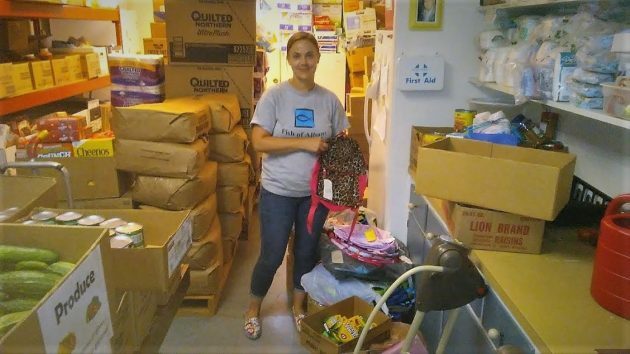 Holly Ryan with school supplies and many other goods in the Fish pantry on Monday. If you’re inclined to help a worthy cause, now would be a good time make a donation to Fish of Albany. This charity has been hampered by the reconstruction of Hill Street, which started in April and isn’t completely finished yet. I went by there (1880 Hill St. S.E.) on the bike on Sunday after hearing that donations had been down. Sure enough, the sidewalk was still unfinished and access to the parking lot blocked. Holly Ryan is the executive director of Fish, which helps people in need with food boxes, clothing and various other kinds of emergency aid. I asked her, and today she gave me a rundown of what was going on. The Fish parking lot has been cut off for more than 30 days. That and the reduced access on Hill Street have caused a slowdown in both donations and the services provided to households, she said. But she’s glad that Fish has a back door on a side street and was able to hand out food boxes that way. “On the bright side,” Holly Ryan went on, “our regular donors are still finding a way to get to us to bring their generous gifts, and we are doing our best to give our clients options for services.” She’s especially grateful to “all our persistent gardeners” who have been supplying fresh produce for the Fish food boxes. Now, Fish is scrambling to come up with backpacks and school supplies to give to 300 Albany students in time for the start of school. The latest word on Facebook was that they still needed about 200 packs to make that goal. Fish hasn’t been easy to get to during the Hill Street reconstruction. This was the view Sunday afternoon. I was under the impression that the 2017 fund-raising efforts in support of the “Snacks for Packs” program had been funded for a two-year period, thanks in large part to Matt and Janel @Sybaris and the generous folks @ OFD (Oregon Freeze Dry). If I remember this incorrectly, please point out the error of my thinking. It sounds as if there are two different programs in effect. Backpacks with school supplies for the start of school, and backpacks with supplemental food for weekends or other periods without school lunches. Is that possible? Constant Observer is correct, they are two very separate programs. Snacks for Packs is a paper sack filled with snacks given on Fridays to those identified by teachers. That is where Sybris/ODF funding went. Backpacks are filled with school supplies and available after August 15 for GAPS parents that come to the Clothes Closet during the following hours: Monday 5-7 PM or Wednesday and Friday between 9AM and 12 Noon. 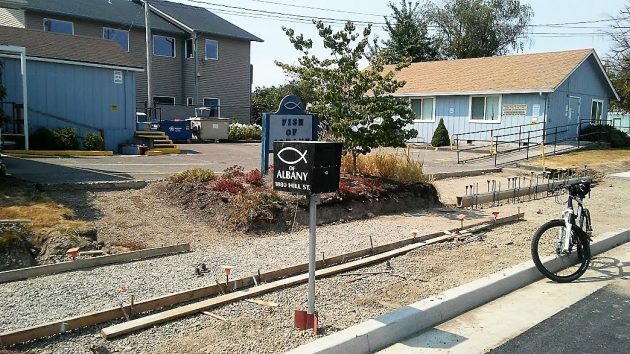 Access to Fish’s parking lot was most definitely denied for more than just the time for the paving! Working there daily is the evidence to support that claim. The garbage company could also support this claim as could volunteer work crews, donors and patrons attempting to access Fish over the past weeks. There was not a sidewalk so causing a definite drop on two sides between the road and the lot where no car or truck could pass. A call was even put in to the construction company to ask for a timeline for the paving. The temporary gravel drive was removed when street work began to build sidewalks and the drain area. I’ve just put “buy a backpack” on my grocery list. I will use a the side road to access Fish to donate it. I hope others will do the same.